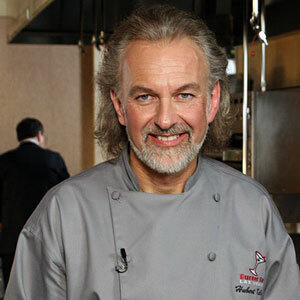 Chef Hubert Keller's magical cooking reflects the many influences of the places he has lived; from his native Alsace with its legendary soups and stews to San Paulo, Brazil where the cuisine pulsates with exciting and bold flavors; to his long-time home in San Francisco where he is a leader of the city's culinary revolution; and finally to Las Vegas where he has pioneered a whole new concept of burger dining that has garnered worldwide recognition. The programs were filmed on location in a stunning vineyard kitchen in Northern California and also in the kitchens of his restaurants: Fleur de Lys, The Burger Bar, and SLeeK steakhouse. Chef Keller prepares a scrumptious dinner starting with a refreshing and healthy asparagus salad. For the main course, he uses a delicious cut of beef, slow braised in beer accompanied by mac and cheese that's brought to a whole new level of goodness. Recipes: Raw Asparagus, Radish, and Shiitake Mushroom Salad; Braised Flat Iron Steak and Wild Mushroom Mac & Cheese. It's Alsatian home cooking at its best with a refreshing celery root salad, an Alsatian pork pie and a spectacular Black Forest Cake. Recipes: Celery Root, Apple, and Walnut Salad; La Tourte de la Vallee de Munster (Alsatian Pork Pie); Black Forest Cake. Chef Keller shares his brunch favorites including a twist on a twice-baked potato that will dazzle guests. Recipes: Chantal's Pitcher of Cosmopolitans; Baked Potato Shells Stuffed with Scrambled Eggs, Oysters, and Smoked Salmon.